So baked pancakes. Did you know that was a thing? We love pancakes and pikelets in this house. I love that you can pack them full of good stuff and the kids still eat them. The kids love them just because they taste good. Most days though we just don't have time to stand at the stove and cook pancakes 4 at a time in a pan. Enter baked pancakes. You mix up all the same ingredients, pour them into a preheated pan and cook in the oven for 20 minutes or so while you go and do something else. Brilliant! My version uses lots of eggs, wholemeal spelt flour and the sweetness of banana, blueberries and a small amount of coconut sugar. I took it out of the oven just before I left for school pick up so it was ready to eat as soon as we all got home. This was a delicious afternoon tea for my boys but it would be a perfect weekend brunch as well. Preheat the oven to 200 degrees celsius / 180 degrees fan-forced. Add the butter or coconut oil to a 20 x 30cm baking dish and place the baking dish into the oven to preheat as well. Place the eggs, banana, coconut sugar and vanilla into a food processor or blender and blitz until smooth. Add the remaining ingredients (except the blueberries) and process for a few seconds until well combined, scraping down the sides if you need to. Carefully remove the hot pan from the oven and swirl it to coat the bottom evenly with the melted butter or coconut oil. 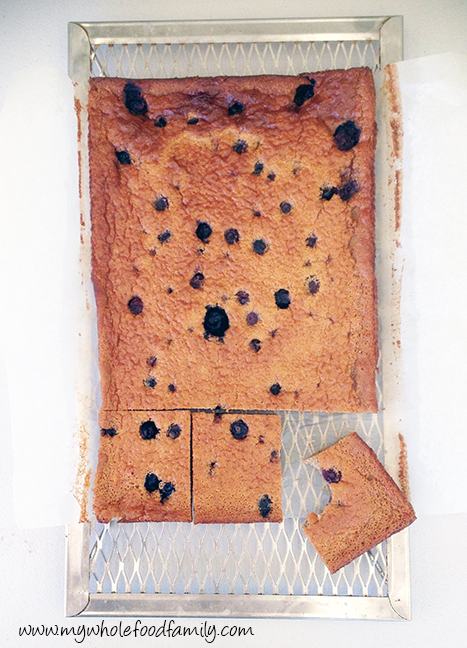 Pour in the batter, scatter the blueberries over the top and return to the oven to bake for 20-25 minutes. It will be golden brown, puffed up and smell amazing. Leave to cool in the tin for 10 minutes before slicing or leave to cool completely and serve at room temperature.